Peel, core and slice apples into wedges, slicing each half into thirds to make approximately 24 wedges. Soak apple sliced in 7-up. Meanwhile, make caramel syrup. 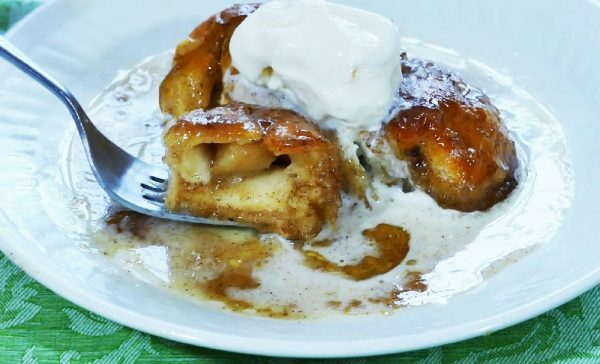 In a medium pan, melt butter, brown sugar, water, 7-up from apples, vanilla, cinnamon, nutmeg and a pinch of salt. Bring to a boil and cook for about 5 minutes. (syrup will be runny.) Set aside to cool. Make dumplings. Pull apart each biscuit to make two discs. Stretch the dough out enough to cover one apple wedge. With tongs or a fork, dunk apple wedge into caramel syrup and place on biscuit disc. Pinch seems around apple wedge (pot sticker or half moon style) to completely seal. Place dumpling in a 11 x 17 inch baking pan. Repeat until all apples and dough make dumplings. (You will have leftover apples.) Pour syrup over and around dumplings reserving 1/2 cup of liquid. Bake at 350 degrees for about 25-30 minutes. IMPORTANT! To get the glaze over the dumplings, brush reserved 1/2 cup syrup over dumplings several times during cooking process. When dumplings are done, serve warm with vanilla ice cream or whipped cream.